• Standalone configurable sensor with switching or dimming functionalities. 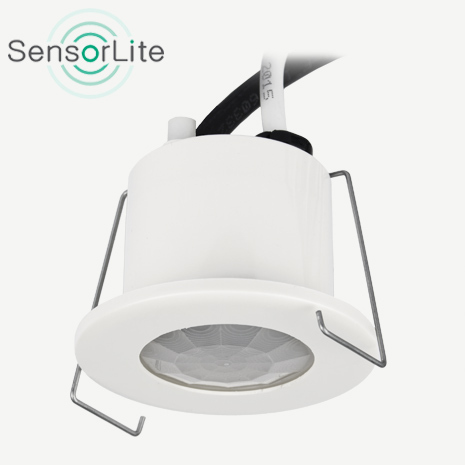 The SET-SEN-DIM-RM-A is a Recessed Mounted Absence sensor for installation in ceiling tiles or plasterboard type ceilings.The SET-SEN-DIM-RM-A semi-automatic multi-sensor is a mains powered, self contained, occupancy and light level absence detector. It requires the lights to be energised in the first instance by a non-latching, push to make, retractable switch. The lights will remain on whilst body heat movement is detected. It will automatically switch off again once movement has ceased and a preset adjustable time delay has expired. The SET-SEN-DIM-RM-A is capable of providing a DALI (Broadcast only), DSI or 1-10V analogue output. It provides automatic daylight linking dimming based on natural daylight ingress.